Gutted. My gear is laid out neatly ready on my loft floor for a trip to my project. Today at work at the Ice Factor I went on one of my old hard problems from last winter’s training that I’d only done a couple of times after many tries and walked up it first try. Fit, strong and psyched. But once again the atlantic weather has the last word. We are still hoping to make the journey and sit out the storms and grab any chances we get to hit St John’s. It’s easy to smugly pronounce that fortune favours the bold (or defiant) on the occasions that it does. 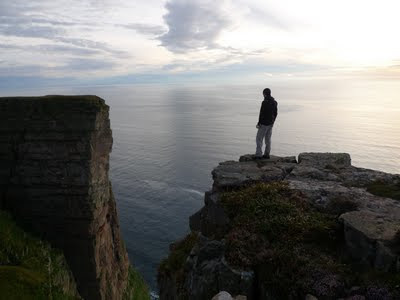 But sometimes, or course, you’ll sit on Orkney for a week in the rain and come home thinking differently. So we’ll see which it is. 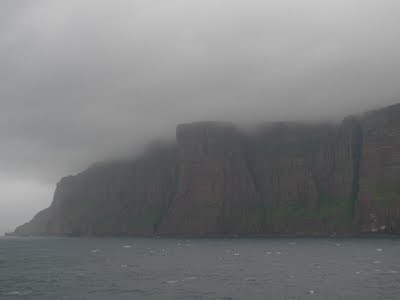 I made the journey back to Hoy, over Cuilags and across the plateau once again and uncoiled my ropes in mist and the ever present buffeting gale at the edge of the cliff. I threw a coil of rope into the mist, but it blew right back over at me. 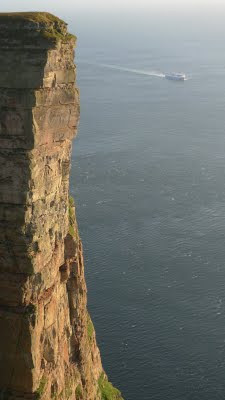 I watched the fulmars for a bit while I got ready to to a ‘bag rap’ to get over the edge in the wind. They were giving me the eye as they swooped past, wings pulled in tight in the mega updraught. No doubt wondering why I’d chosen to be here in this grimness. 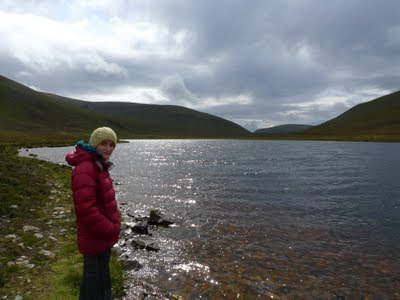 But the arrival of rain on the raging wind soaked everything within seconds and there was nothing for it but to jog back over the plateau like a drowned rat and eat vast mountains of pasta and vanilla cheesecake at the hostel with Claire. It’s grim, lets go home and eat cheesecake! 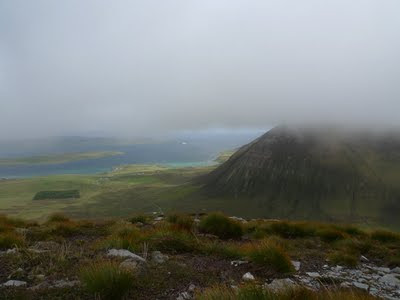 Next day, the soaking started even earlier before we’d even reached the crag and with an armageddon front forecast for the following day, it was looking like a wet hillwalking trip to Orkney. We sat on the edge of the cliff, waited, filmed rain. And so the sun came out for us, and the climbing could start. 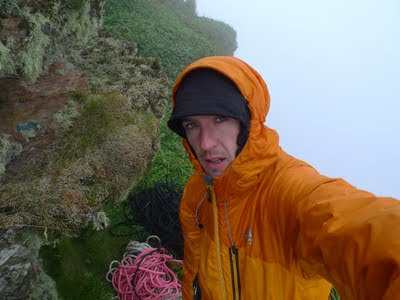 It started for me with a dousing of regurgitated fish and bile from an angry fulmar on the abseil descent. It made for a heady smelling 6 hours on the rope I can tell you. Didn’t seem to do my climbing too much harm though. I got my objective of the big link through the entire top pitch on the shunt. So what happens now? Well, I have to wait for a bit until I get a chance to return to see if I can climb through all those 18 lower pitches and even get to the big pitch, never mind the top. When the passenger ferry takes a detour around Hoy to avoid the gales across St John’s, perhaps the climber should follow suit? Or not. I can’t say I’m too confident it’ll go. But I’m confident It’ll be quite an experience trying. In many ways it still feels like early days for trying this project, and it’s probably good for me to view it that way anyway. I’m on the rollercoaster of hard new routes; One minute it feels like E10 and possible soon, the next it seems way out of my grasp. It's really too big to get a handle on yet. I guess right now I have to focus on what’s under my control. And thats training, training, training. Trained last night after finishing work just before midnight. I totally didn’t feel like training, but during and afterwards I was really glad I did. Walking off the hill from Kentallen last week after doing Durorband with unexpected ease, I felt that feeling of lightness, fitness and a readiness to climb something really hard that I’ve not felt so strongly since before climbing Echo Wall. I can’t believe it’s been a year since I really felt this. For sure, hard climbs can be done without it by pure force, but this state and this feeling is what’s needed to break barriers. 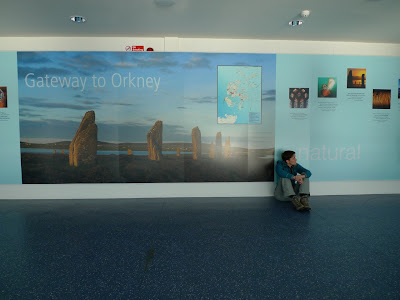 Good timing then, as I was heading back to Orkney the following day for a second look at a really amazing project. A couple of years ago, Oliver Hill sent me a message pointing me in the direction of a possible good project. In 1970, he and Ed Drummond had a fairly gruelling adventure opening a 500 metre long aid route on St John’s Head on Hoy, over six days. The Longhope Route is the longest wall climbs in the UK and everything about it also makes it arguably the most adventurous. In 1997 John Arran and Dave Turnbull made a free version of the route, climbing the lower pitches before escaping off left, and returning a few months later to abb in and climb the top part, avoiding the headwall cracks by a 4 pitch deviation up grooves on the left. Even though their route avoided the hardest part of the Longhope Route, it is still one of the hardest adventure style trad climbs anywhere, with 23 pitches of serious, loose and sometimes birdy climbing, and an F8a pitch near the top. 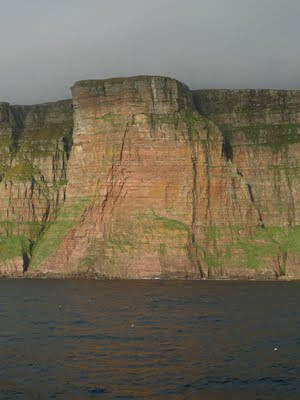 St John’s Head - quite a cliff! Oliver pointed out to me that a free ascent of the original headwall cracks (about pitch 18) might be 8c+ at a guess. So I swore I would get myself there, sooner or later. Last month, sooner or later arrived and I was dangling in space, 350 metres above the sea inspecting the unbelievable overhanging headwall of St John’s head. To look at, the cracks reminded me of my own route Rhapsody - a smooth, long leaning wall, with a thin crack petering out into the wall with tiny edges beyond. But this time it was 18 pitches up! Fairly irresistible as you might imagine. I wasted myself for two days cleaning it and then trying the moves. Getting seriously dehydrated and stumbling back across the plateau in a bit of a daze. It seemed like Oliver was on the money with his grade estimation and I thought perhaps it was too hard for me. 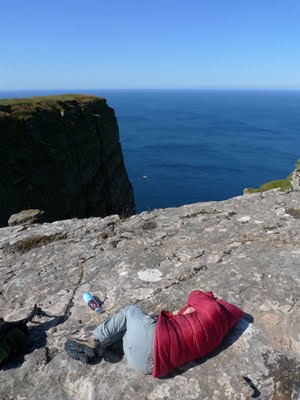 Between then and my next trip, I trained, dieted and went over and over what would be needed to climb a 50 metre pitch near my sport climbing limit, but on trad gear, 18 pitches up, with some puking fulmars to fight with passing the gear breaks? For now I’m heading back to work on it for another couple of days, followed by more training no doubt. 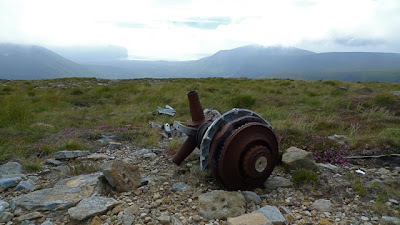 I’ll let you know how it goes..
Wreckage of a Liberator Bomber near the top of Cuilags, on the walk-in to St John’s Head. It crashed here in January 1945 in a blizzard killing all it’s crew. 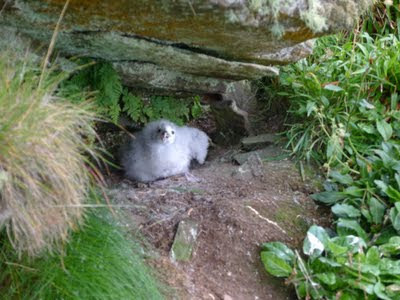 There are quite a few plane crash sites around Hoy and grim stories to go with them, which give a flavour of the inhospitible nature of the place. The poor soldier they sent to guard the wreckage of one actually died of exposure at the site. 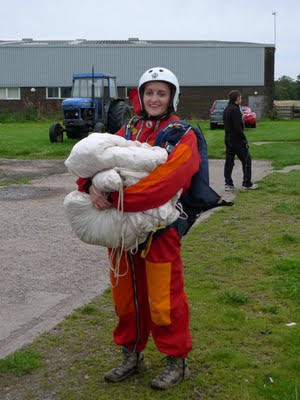 The long approach to St John’s and ever-present 60 mph gale has a levelling effect on Claire. 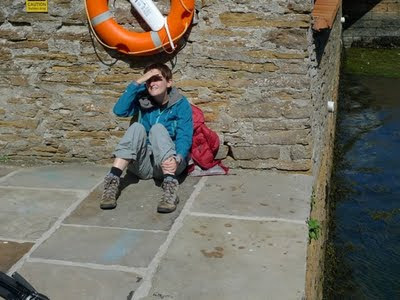 But at least a sheltered spot in Stromness made it feel less arduous on the way home! 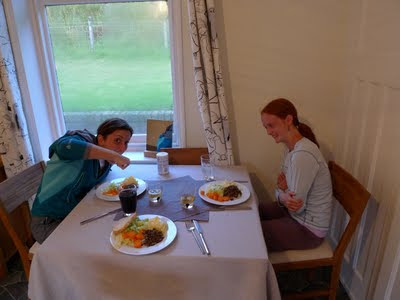 A good feed on returning to the Great Glen. Claire gets stuck into her Haggis like a proper teuchter. Alicia is little more hesitant. After my last post about John and Layla turning their hand to good food and gallery running, it got me thinking about all the creative people I’ve had the privilege to meet through my work in climbing. There are some common themes among them for sure, but also each of them has their own lessons and perspectives to offer that are so inspiring and educating in their own way. So I thought I’d start a wee blog series bringing some of them to your attention, both to share the discovery of the fruits of their efforts and maybe to learn from them too. Misha Somerville is one of these inspirations, never far from my attention over the years as his music is high on my ‘most played’ tunes on my ipod. I was first introduced to his band Croft No. 5 at a gig in Glasgow several years ago, and have travelled, trained and pounded my way up mountain paths with their reels whistling through my head ever since. But since Croft No. 5 split up a couple of years back, I often wondered where that creative energy is channeled when the focus of bands disappears? I actually tried to track Croft No. 5 down last year to arrange permission to use some of their music on our fist film Echo Wall, but without success. So it was a nice surprise earlier this year to get a message from Misha, appreciating our work (and music choice!) on Echo Wall and talking a bit about what he’s doing now. Turns out he’s been climbing for one thing! But like many creative people I’ve met, he has diversified his activities to excel in many ever expanding areas, no doubt using the skills he’s learned from the initial discipline. So after establishing various arms of his work in instrument making, design and photography, now he has made his first book which he took the trouble to send me. Like many first books, films, albums or any creative entity, it clearly contains a lot of honest and unfiltered aspects of the person behind it. The book was a creative outlet while Misha recovered from ME over the course of a year or so. The condition had developed after an extended trip across north Africa was cut short by contracting Malaria. The book, Bamako Boom Boom takes us through Misha’s adventures well off the beaten track in North Africa. There’s no doubt he went to some considerable effort. and at times obvious risk to see the people and places behind the bubble of the normal tourist trails. It was nice also to read Misha’s reflections on what he saw and where this personal journey taught him, told with a succinct style and never self-indulgently. I read this while I was in Spain on a sport climbing trip, and it provided just the engagement with a wider sense of adventure in what the world offers that balanced out the narrow focus of pure sport climbing. In fact it really reaffirmed in my mind why I go trad climbing to the weird and wonderful corners that Scotland has to offer. I don’t know why but I didn’t really expect a book like this to do that. 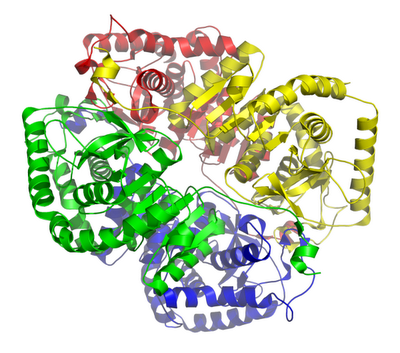 The first chapter can be read here. 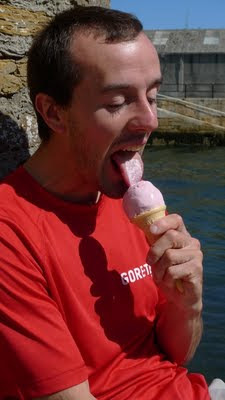 Misha’s blog is here. 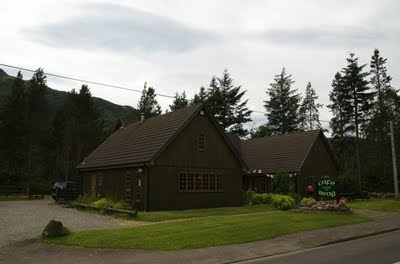 The Cafe Beag in Glen Nevis brings back some memories for me - of sitting outside it with tea and cake in the sunshine with Claire when we first spent a long trip there aged 18. I associate the place with those feelings of anticipation of finally getting a chance to try all these routes I’d read so much about, and that young feeling of anything being possible... after another cup of tea. Seeing it closed and generally looking a little forgotten recently made me sad as I passed by. So Claire and I were well excited to hear from our friend John Sutherland that he and his partner Layla have taken it over and have it open again. So you know the place to visit next time you are in Lochaber - it comes with our highest recommendation. Both very creative people, John and Layla’s vision for the place to make it a bit of a centre for local art and photography too, and the collection on show there is already look pretty impressive. Food, coffee, art and Layla and John’s good company in Glen Nevis, 10-5 every day except mondays. See you in there. Directions: Drive up Glen Nevis from Fort William. After a mile or so you’ll come across it right by the road, just before Glen Nevis youth hostel.